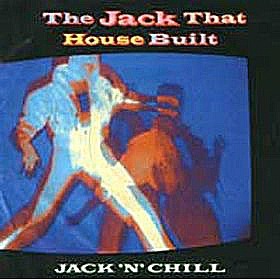 "THE JACK THAT HOUSE BUILT"
This is the original 1988 12" version of the instrumental house track The Jack That House Built, which was propelled up the music charts by club DJ's, although it was mostly ignored by mainstream radio stations such as Radio 1. The tune reached #6 in the UK singles charts and was created by Vlad Naslas and Ed Stratton. I was a big fan of this track and really enjoyed some of the dance music from the late 80s and into the early 90s. However, after this the genre kind of lost its way, and exciting, original dance tunes became harder to come by. Jack N' Chill's follow-up single failed to break the Top 40, apparently, due to the factory not being able to produce enough discs - the duo then gave up with the project and went their separate ways. Ed Stratton went on to create Time & Space, a leading supplier of music sample CD's for musicians and DJ's - I bought one or two of their CD's myself when I used to create my own music back in the 90s.